Go browse all of Kesinger's prints, books, etc here. "I Hate Everything" - ha! This and more here at Lara's shop. Plus there are baby donkeys and bees and bunnies, oh my! Go squee over the rest here. Go shop the rest here. I can't stop staring, it's so perfect. 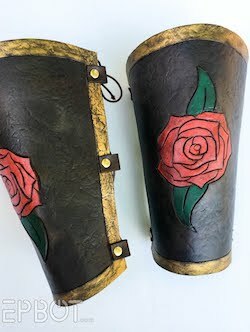 Check out his shop here. 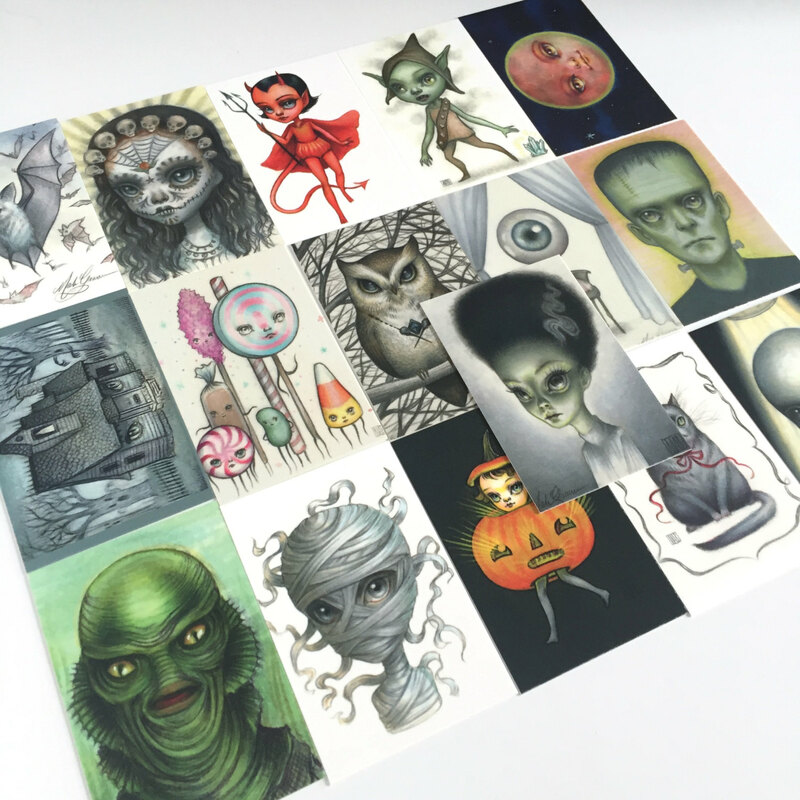 You can also get them as larger prints or even stickers here at her Etsy shop. 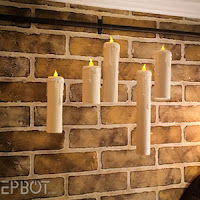 It's about $14 here in her shop, and I think I'm about to cave and buy one for this year's Potter party. Plus lots more spooky sweetness! Go shop the rest here. By Stanley Morrison, grab it here. Honestly I think I could keep going for 6 more pages, it's been so fun hunting these down. Still, I guess I should get to the give-away. This Wookie-The-Chew set of 2 signed prints by James Hance. So be sure to let me know in your comment if you like either/both of those, so I can enter you in those drawings, too. Internationals welcome - I'll ship anywhere - and I'll announce my randomly selected winners in my next post. PLEASE WATCH FOR THAT ANNOUNCEMENT; I've had several winners not claim their prizes the last few months (like that Wookie-the-Chew set! ), and there's no way for me to track you guys down! Oh Oh! Long time lurker first time commenter. Please put me in the drawing for the wall-e print. 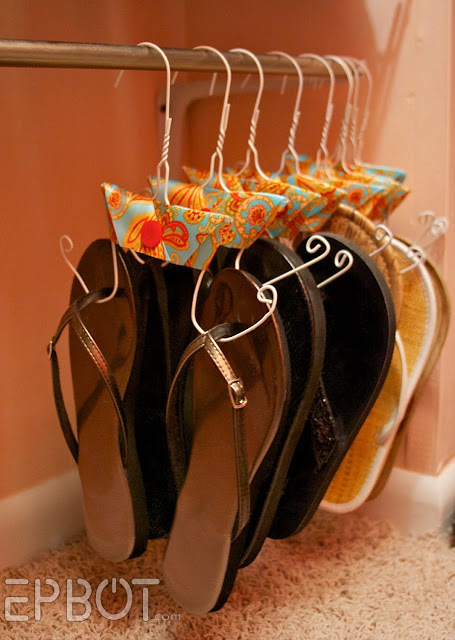 My husband would looooove it. (Cos he loves wall-e AND is the kind of guy who would hold the umbrella for someone else. I need that Wall-E print. I need it muchly. I really REALLY do. I love Wookie-The-Chew, Pumpkin Dragon, and those awesome postcards!! Wookie the Chew! I love that artwork! I've got tabs open with all these shops, can't wait to check them out. I always love seeing what you find, thanks for sharing and thanks for the chance to get some awesome art! Please please please pick me!!! I *need* Boba Fett (which my phone keeps trying to change to "Bob's Feet" lol) and I also love the Wookie The Chew prints! That's the WRONG Addam's Family! John Astin and Carolyn Jones 4EVER! I’m in love with the bat!! Omigosh, that Thestral! I love it with my whole heart! Also please put me down for the Wookie the Chew set! Omigosh! I love love love that Thestral! I love the Labyrinth print from your give-away board and the Wookie-the-Chew one above! I'd love to take the travel by TARDIS print out of your closet and show it some love! Thestral! I love love the Wednesday print too. And ohmigosh the little Knight! I love the Wall-e print. Wall-e is one of my favorites. Ooh, I love the Wookie the Chew! 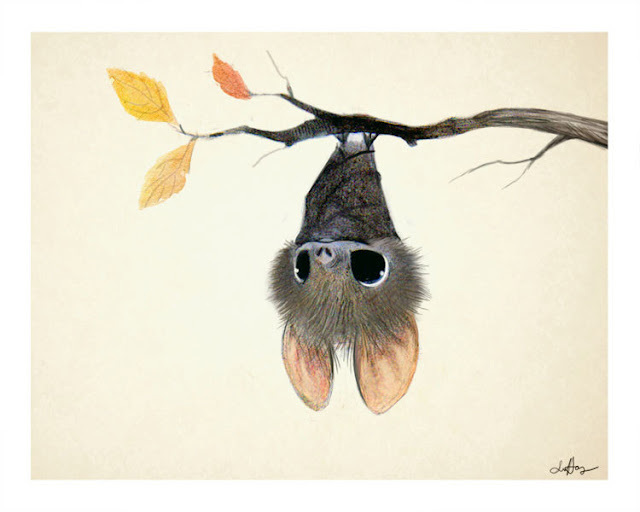 I don't usually like bats but that one is adorable!! That bat...so cute! And I would love Wookie the Pooh. Oh - I love the wall-e and the Wookiee! Or anything on the art board! I'd love to be entered for all 3, the wildcard, the wall-e, & the wookiee the chew. Thanks for the giveaway! Oh Wall-E! It has been my son's favorite movie since he was very little. His 13th birthday is coming up. A signed print would be a great way to give him something he'd enjoy now but will always keep. I love them all - so please enter me for all of them. The Wall-E is adorbs! Or anything on the artboard of course. YAY! This is way too adorable of a post to be spooky. I love it all! And I'd love the WALL-E print too! Oh my yes! I love it when my favorite blog (this one!) features my favorite holiday! I've been commenting for a couple years now hoping to be a wildcard winner to get one of the Wookiee the chew prints, so please enter me for that drawing and for the wildcard! Thanks for the halloween squees! Wookie the CHEW!!!! I swear they sell out so so fast. I'd love to win the wookie the chew prints. They're so cute! I love your art round-ups. I'm always amazed at the talent! That sweet little bat! I can't stand it! I love the Wall-E, my favorite Pixar movie! All of it is amazing! I'd love to be in the drawing for both pictures. Wookie the Chew! Love James Hance. oh my heart! love them all !!! 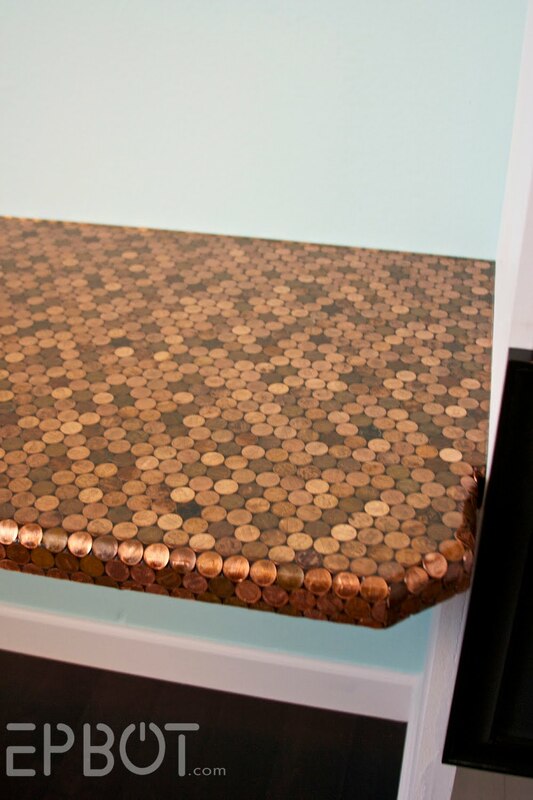 I love seeing your curated links every month, but this might be the best one. So spooky! Both of the bonus drawings look great, too! That widdle bat is so dang adorable!! I would love to be entered in the wildcard or Wookie-The-Chew drawings. Thanks! I would love to win either of the giveaway prints. OMG I never comment but that WALL-E signed print is TO DIE FOR!! Please enter me in all the draws!! I hope you are all doing much better having had power a few days. 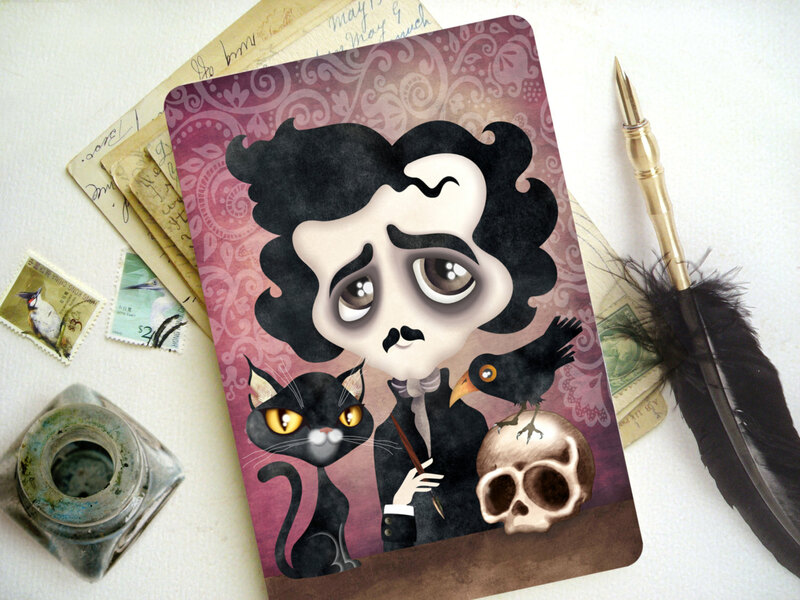 That Edgar Allan Poe postcard is so cool! I would love to win the Wall-E print or the Wookie-the-Chew prints. I love your Roundups! I needed a smile today. 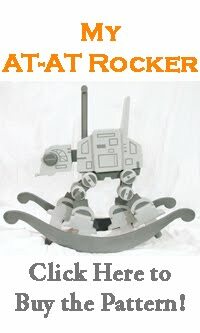 I love both the WallE and the Wookie the Chew as well! I love the Wookiee-the-Chew set, sooooo cute! 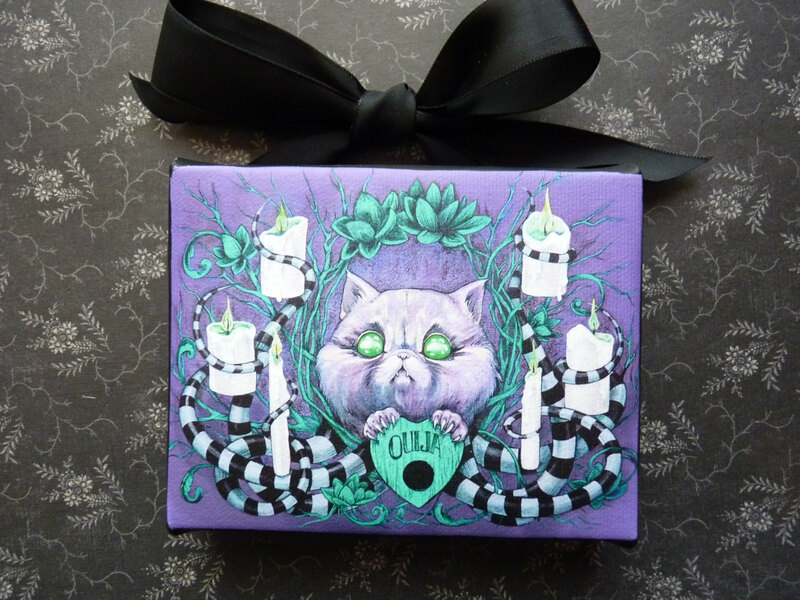 Great art finds as always, Jen! So much great art this month! Please sign me up for Wookie the Chew & Wall-E drwaings too, please. The Wookie the Chew is so cute! Omigosh! That little Frankie is wearing a Tesla shirt! What a great detail! Main draw please! Wookiee the Chew! Or wildcard, of course. I remember when you posted Stanley Morrison dragons before, and I've been wanting to buy a set of fruit dragons for our (future) kitchen - I just haven't pulled the trigger yet because we don't really have the room to hang them. But I WILL, and it will be glorious, all thanks to your posts! Ooh - how could I just pick one of them? I’d love to win either. I have something like 18 Ben Byrd prints, and we saw him this weekend at Salt Lake Comic Con. Somehow I did a brain fail and we bought Hagrid, but didn't buy Harry, Hermonie and Ron. Silly us! I'd love those for sure. Love the Addams family prints this month. And Wookie the Chew is always a favorite! 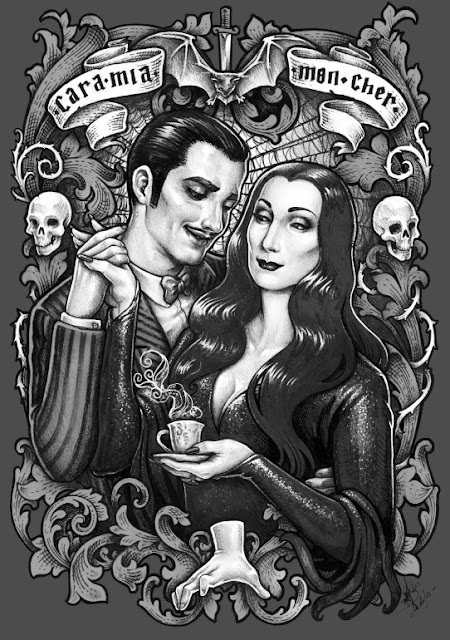 My husband needs Gomez and Morticia for our 20th anniversary next year, he just doesn't know it yet. Please enter me for the wildcard and Wookie-The-Chew. I love those Wookie the Chew and the Wall-E prints! 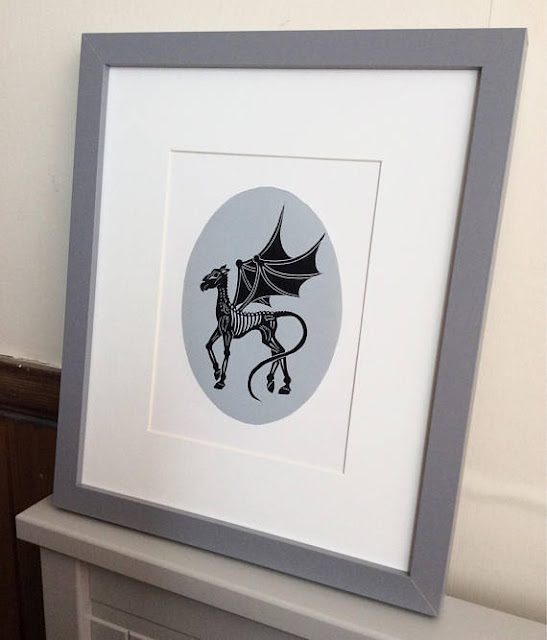 And the thestral print is to die for! I'd love to enter the drawing for the Wall-e print! Oh wow, I love that Gomez & Morticia one! And the Wednesday one is cool too. Even though it all isn't necessarily to my taste, I LOVE that you post these art roundups and I love going and looking at the artist's other stuff. Thank you! Wall e and wildcard, definitely!! We had SLC Comic Con this past weekend, and I always love going through the Artist Alley. So much goodness! Thanks for sharing yours. Would love that adorable Wall-E. Very pretty! With the heat here it's hard to think Halloween is coming. I hope i didn't miss a draw in the past! I would love to win something! I love that wall-e print!!! 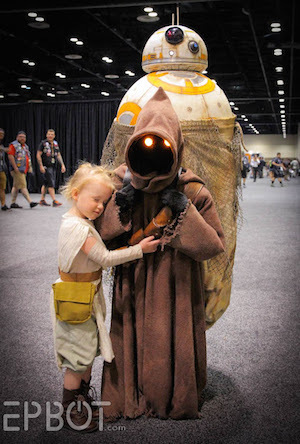 Absolutely squee worthy! I see how that "Halloween Knight" picture captured your attention. It's as if he had a Patronus. I'd please like to *looks around if anyone is watching* *lifts fist* ENTER ALL THE DRAWINGS! I love the art round ups! And I love halloween art! woo! <3 Also I'd love that wall e, as well as the wildcard! Oh you Wookie the Chew! I adore you! The adorable side of Halloween is my favorite. I don't do skeery. Please please please enter me in for the signed Wall-E print.. So so so cute! Thank you, absolutely love the pumpkin Toothless! And the Poe-st card with his big sad eyes. And his adorable raven and kitty. I love the Wookie the Chew prints. And I would like to be in the general drawing. 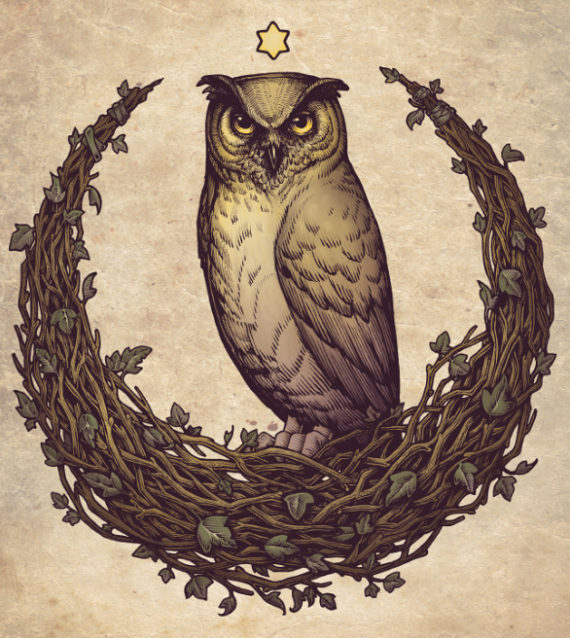 OWL! That is so gorgeous. 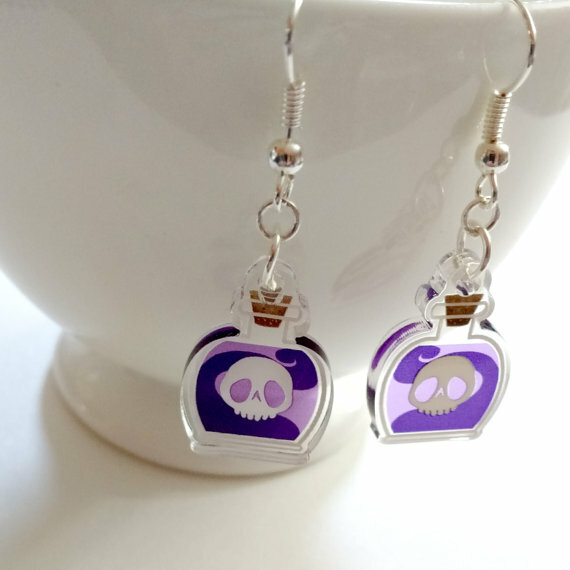 And I love the potion bottle earrings. 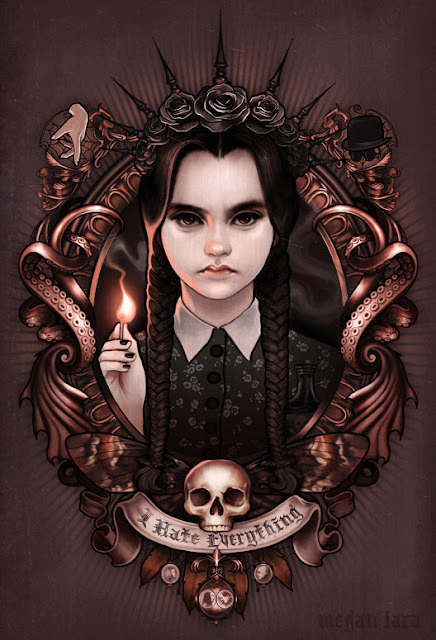 I am totally in love with the Wednesday Addams/Addams Family ones! And Poe! Too much to pick from! For the wildcard, the Wall-E print. Love him so much. There is so much wonderfulness here! I had to just stare at the Halloween Knight because it's so lovely. And I am all about the PSL (and dragons), so the pumpkin dragon is awesome! Please enter me for the general drawing and the Wookie. I have been adding a lot of these artists to may favorites list so I can find them at gift giving time. I like wookie the chew. 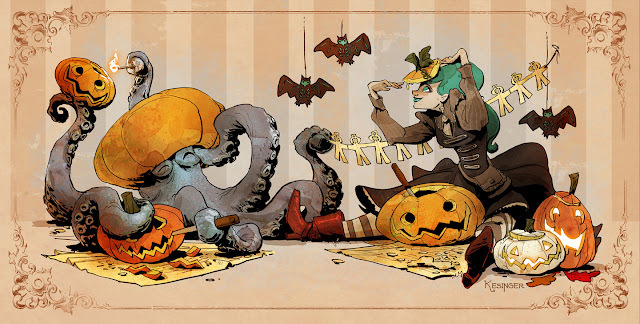 I love all the art you find, but Pumpkin Dragon, the little bat and that Wall-E print are so cute! I always try to find a couple of my favorites to comment on, but can hardly ever pick because everything is always SOGOOD. I love the typewriter, the bat, and 'Halloween Knight'. I also am loving the 'Monster Parade'. I didn't read all the comments, but did anyone else notice on the close up shot, that Frankenstein is holding hands with a little girl who is holding a severed arm?! Can I call that adorable? Is that wrong? How about great attention to detail? Anyhoo, I thoroughly enjoyed all the offerings today, so please enter me in ALL THE DRAWINGS! Yay! omigosh! the wall-e would be an awesome christmas present for the husbot! Wookie the Chew!! So cute. Love them all. Wookie the Chew is adorable! Please enter me in the draws! I'd love the Wall-E print or so many lovely things on your board. Yay! 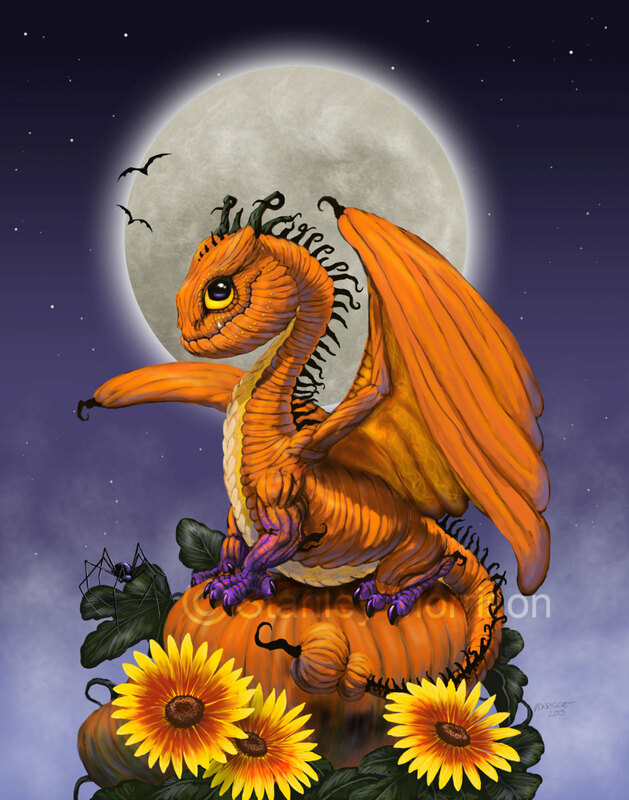 I looovvveee the pumpkin dragon!! and the baby bat! so cute! Enter me for both please! So cute! 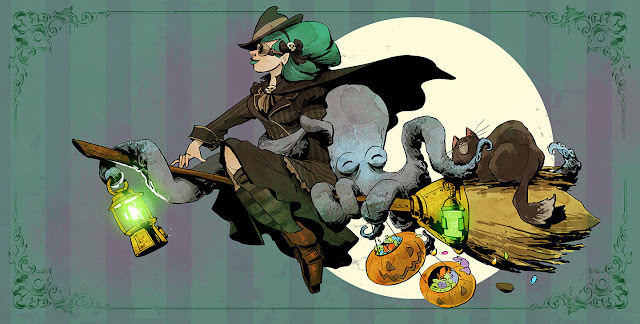 I'm so excited that you showed off Medusa Dollmaker, MeganLara, and Brian Kesinger. I love them all so much. And that Wall_E print is the most adorable thing. It would live next to my jewelry box. Omygosh these are all so awesome!! Would love either of the randoms, it's so hard to pick which is more adorbz! I gues it's time to start decorating for Halloween, thanks for the inspiration. Please enter me for all 3 drawings. Thanks! Ooh I love so many of them, I love the Otto and Victoria, the Thestral, Sting, Halloween Knight, or Wookie the Chew. I love your round ups. Oooh, OOOOOHHHH!! I'd love to enter for Wookie the Chew or the wildcard! I'll leave the Wall-E for someone who would love him more. Too cute! Would love the Wonder Woman art nouveau poster if it's still available. Love the James Hance and the Wall-e print too. 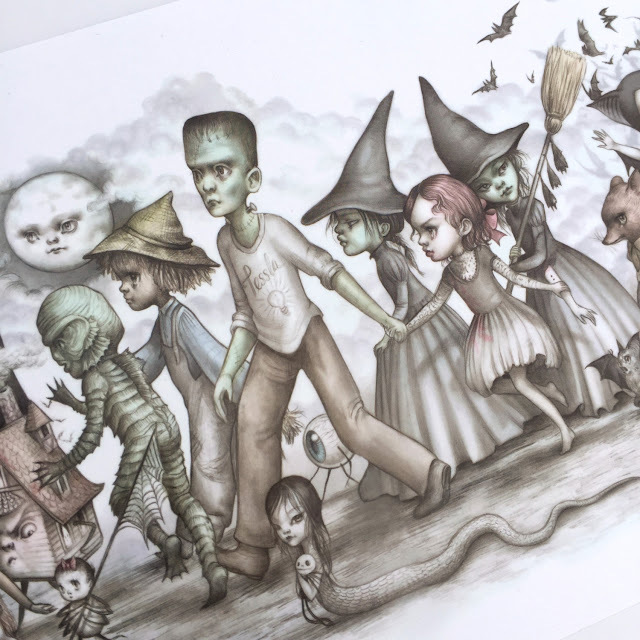 I keep hoping to win so I could get one of the James Hance prints. And that Wednesday.. burn it all! Love it. 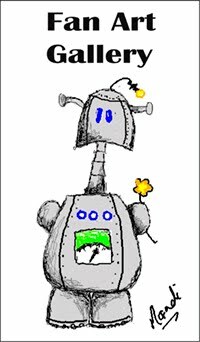 And many thanks for introducing me to Brian Kesinger in one of your early Epbots, because I am now working on a Victoria & Otto costume for halloween this year! :) I've got my green wig and my Otto all ready to go, and the dress is coming along. So many wonderful spooky goodies! I picked up the Wednesday Addams from Megan at GenCon. I was so excited to see her there. I'd love some spooky art for my office wall. I just met Mab Graves at an art show in LA and she was one of the sweetest most loveliest person. Her art is amazing as well. I would love to be entered in all three drawings! I swear, I made louder squeaks of delight the more I scrolled down this post. Gomez and Morticia! That wee bat! That pumpkin dragon!!! Such cute stuff this month! Toss me in the wild card draw, and the Wookie-the-Chew please! Ah the Wall-E print! Love it! I have wanted Wookie-the-Chew for so long! Put me in for those and the wild card, please! Wookie the Chew is amazing!!! So adorable. I would love to put it on my wall. I would adore the Wall E or the Pooh! You are amazing! I would love to win Wall-E. It was such great love story. One of my absolute favorite. I also LOVE both the Wookie and the Chew and the Wall-E prints. Some of these made me think of new costume ideas!! I love Halloween. I wish I knew how to sew. SQUEEEEEEEEEEEEEEEEEEEEEE I need that Wall-E print!!! All so wanty!!!!!!!!! I’d take any of these. We love Wookiee-chew!! Please enter in the drawing!!! I see you getting into the spirit of the season, nice. That EVA and WALL-E picture makes me so emotional. Thanks for the chance to win! Please also enter me in to the Wookie the Chew. Oh my Gosh!! The Shining typewriter I LOVE!! That movie has a special place in my heart as my first horror film and that my mom and I shared a love for this film. Even have the funko pops!! Always love the new art posts! Would love to win! The bonus ones I would like, too! Either one would make great gifts for people I know. That baby bat is the cutest darned thing I've ever seen. Love it all really including the bonus giveaways. So great, as always. I have James Hance's original set of Wookie the Chew art up on my wall, along with his Fozzie & Kermit Shaun of the Dead homage - he's so amazing. Love this new art, that baby bat needs to be on my wall, and the Thestral is gorgeous! 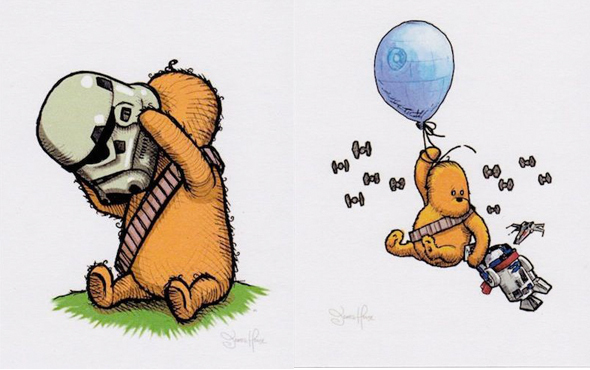 I can't believe the Wookiee the Chew prints have gone unclaimed, I love James Hance's work and these are fantastic! I would love to be entered to win any of these works. THE BABY BAT!!!! And all of the Addams Family art is gorgeous. Ahhh. Halloween is muy aesthetic and I'm loving it. I've been drooling over the Wall-E piece for ages! Please put my name down for it! 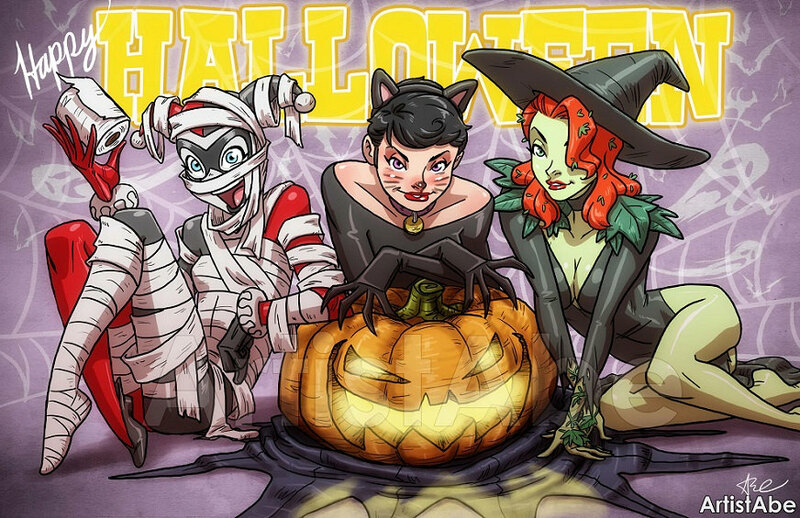 O.M.G, that Harley, Ivy, and Catwoman! Also, love love LOVE Wookie the Chew. The bat melts my heart :) :) :) . I also really need to look up more Otto & Victoria-- so awesome! Please enter me into the wildcard drawing and also the Wookie the Chew... Thank you so much!!! These artists are all so talented. I loved the Addams prints. I would love to be entered for Wall-E and the Wildcard. There is an adorable Stitch print on there that no one has snapped up yet. Oooh, that knight is so cool! 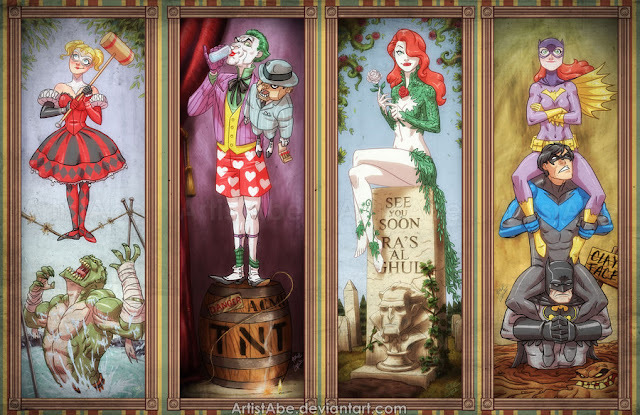 As a big Batgirl/Nightwing fan, though, my favorite is definitely the Haunted Mansion scene with them and Batman. Love it! I would love any print! I love the Otto & Victoria, my older sister has like all the books. Either and wildcard for me please! Thank you for sharing - you always give me new artists to support!!! I love Halloween and spookiness! 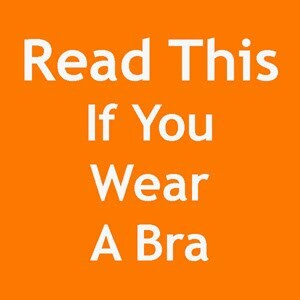 Bonus points that I'm reading this while its pouring rain! Yay! I love the wookie-the-chew pic! My large ginger cat is named Chewie! 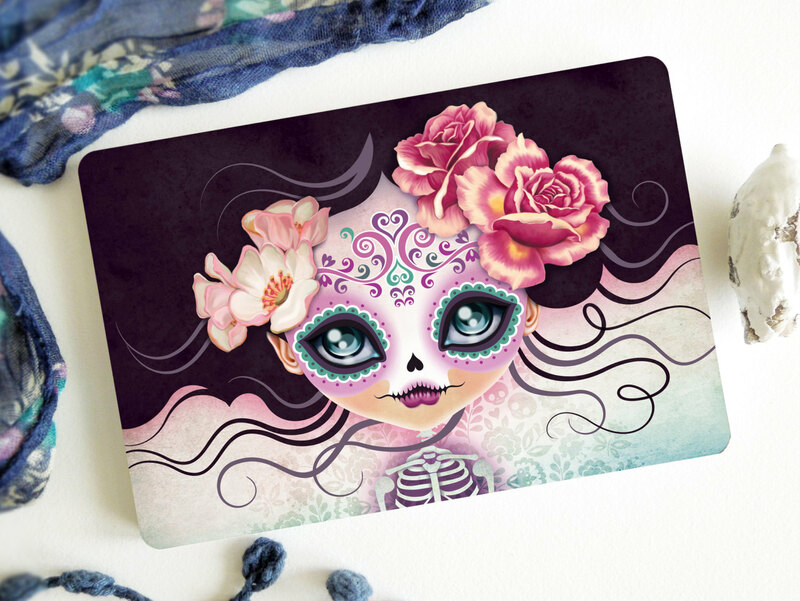 FYI: The link for the Sandra Vargas postcards didn't work. On the plus side, what a great collection. I really appreciate that you give shout outs to artists! Love, love, love the Wookie-the-Chew! Fabulous selections this month! Hard to choose a favorite, but I do love me some Otto and Victoria. And I can't choose between Wall-E and Wookiee the Chew, so I guess, enter me in the drawings for both. Thanks for all the eye candy! I have been trying to contain my halloweenness all September and now all bets are off! All the sugar skulls and bats and purpleandorange here I come! Thanks for all the inspiration! And me, I'd love to win Wookie The Chew. I want to hug him. Love, love, love those earrings! I really, really, really, want to win that Wall-E print. I've been putting my name in to win it ever since you added it to the board. I can't believe that it's been there for so long. If I can't win that one, I'd really like the Sea Creatures prints, since KH are my initials. Thanks as always for doing this! Please enter me for the Wookie-the-Chew and wildcard slots. Thank you!!! Always love Wookie the Chew :) Thanks for having a giveaway! Ooooooh I would love to win either of these!!!! Wall-E!! Be still my heart! 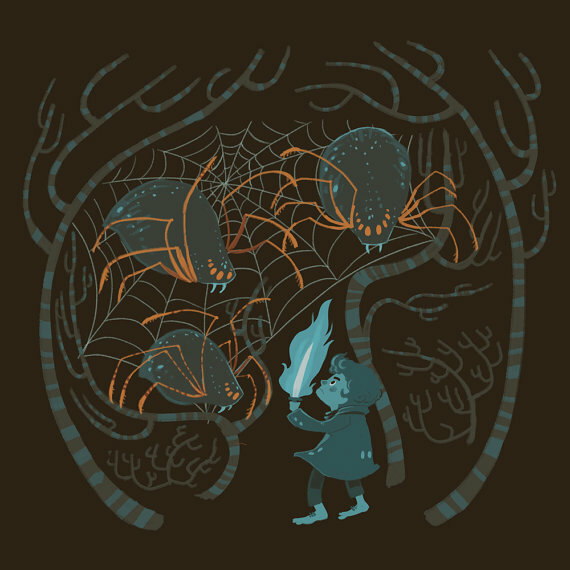 I love the thestral print and of course Wall-e and Eve! Eeeee so many amazing Halloween prints!! How can one possibly choose between Wall-e and Chewie?! I love Wookiee the Chew. 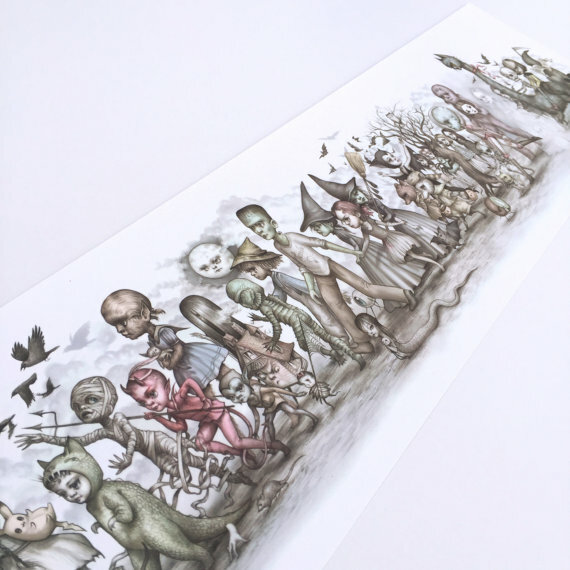 And those Graves prints remind me of the illustrations from Maurice Sendak's "Outside Over There". For some reason, those illustrations were spooky to 6-8 year old me. ::tries to remember if I ever forgot to check the follow up post for an art giveaway:: No idea. Apologies if I did. The bats reading the book in the PentwaterPaper link? 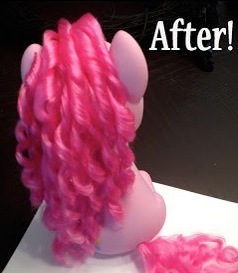 *SQUEEEEEEEE!!!!!!!!! 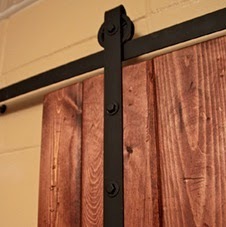 * So added to my list of future purchases! I like both of the wildcards. Yes, yes, yes, me, please! I love the WALL-E print! And the one of Gomez and Mortician looks sweet in their way. As always, thanks for sharing such inspiring art. I don't know who would pass up that Wookie the Chew set, but I'd love to add that to my collection. I love them both. The chewy holds a special place for me, but seriously, they're both adorable! Love the Wookie the Chew print! 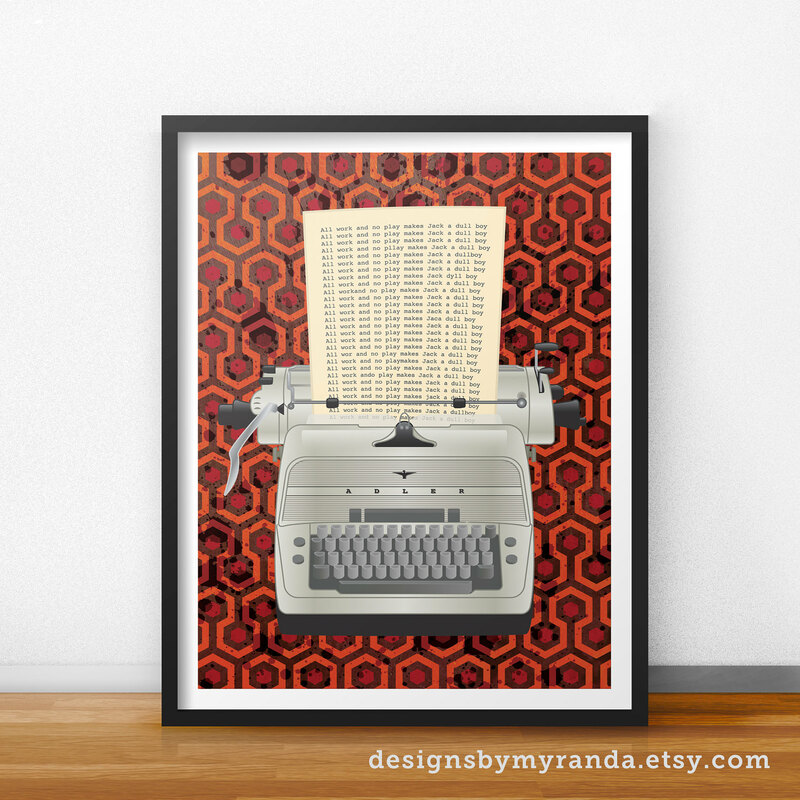 And The Shining Print is so clever using the hotel's carpet as the backdrop for the typewriter... but way too creepy for me. Oh man I NEED that Wednesday Addams print. And I'd also love the WALL-E one! Love the simplicity of the thestral, but uhmuhguhd that bat is sooo adoraballs! I love winnie the Pooh and one of my children loves Wall-E, so both your prints this month are perfect for my family. Please enter me! Love. Just....Love. Trying to choose a favorite here is like trying to choose a favorite toe. All the drawings, please! All of this is beautiful! As always I'm loving the art that is inspiring you. It's even inspiring me! Love love love your art stuff. Fun Fun. Chewie, that darling bat, Wednesday Addams, THAT DRAGON!!!!!!! Please enter me in all the drawings. My name is Joy. Pentwater Paper's little bat is totally adorable and I love the Gorgonist's acrylic charm jewellery! Wildcard draw only, please and thank you! I would love to be entered. 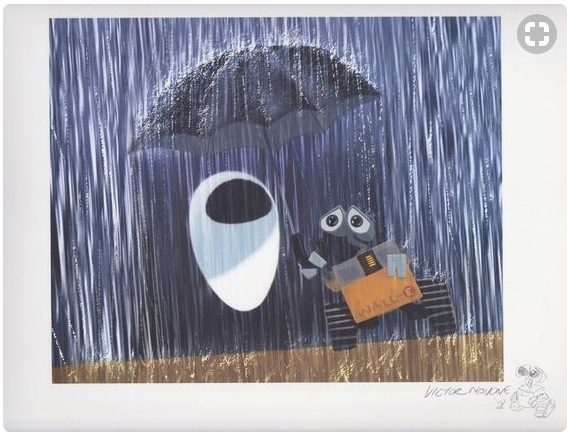 And would also love that Wall-E print! I would love to have one of each of these. 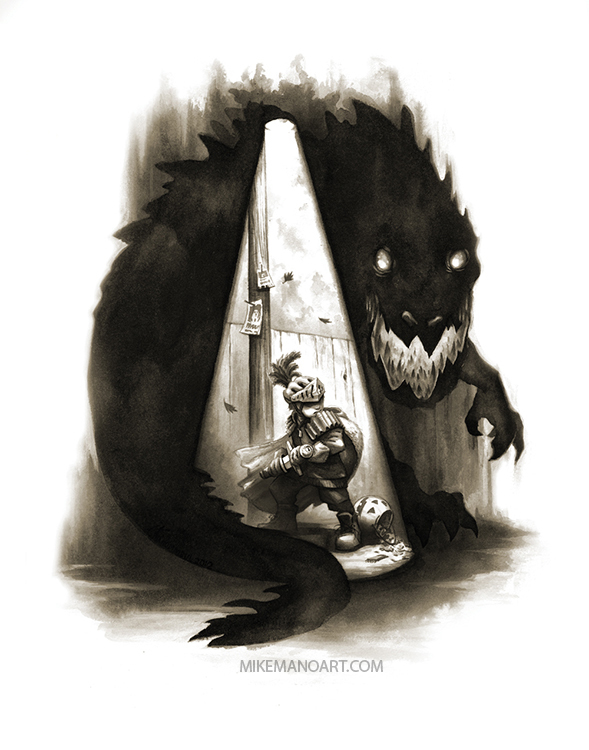 I love creepy stuff and Halloween! Please enter med in the wildcard drawing please :D.